Our guided tour usually begins at the Galleria dell’Accademia, which houses the masterpiece of Michelangelo: David. David was commissioned in 1501 by the Cathedral Works Committee (Opera Del Duomo). At the age of 26, Michelangelo was given a leftover block of marble that came from the mountains of Carrara, one that had previously been worked on by various other artists. The piece was intended as a monumental work, a testimony to the city’s republican pride, not one for close confinement, but was moved to the Accademia in 1873 (from outside the Palazzo Vecchio, where a replica now stands) to protect it from the ravages of time and the weather. Next, head to the Piazza del Duomo. The Florence Duomo is dedicated to Santa Maria del Fiore and is typical of Italian Gothic architecture. Arnolfo di Cambio designed the present building. The dome dominates the exterior and serves as the predominant feature of the Florence skyline. 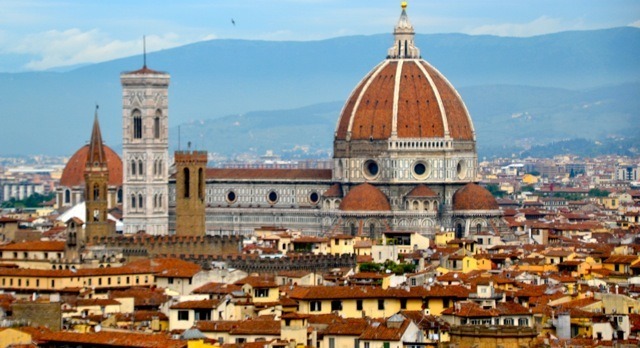 It was added in th e15th century and was designed by the famous Fillipo Brunelleschi. dominates the exterior, was added in the 15th century on a design of Filippo Brunelleschi. A visit to the Piazza della Signoria is in order. The Piazza has been the political heart of the city from the Middle Ages to the present day. There is a great spot here for gelato and we suggested a stop to recharge. Close to the Piazza della Signoria is the famed Ponte Vecchio. The Ponte Vecchio is the oldest bridge over the Arno River, crossing at its widest point. It dates back to Roman times and has been re-built on several occasions, though it survived the bombings of WWII. You will cross over to the other side of the Arno and get a glimpse of the exterior of the Pitti Palace, former home to the Medicis. A stop will be made in the Square of Santa Croce (Holy Cross), one of Florence’s largest squares, and traditionally one of the city’s main arenas for ceremonials and festivities. Florence Guided Tour – 3 hrs . Priced upon request.